In addition to rankings of the top performing consumer-rated loyalty programs, this summary report will provide insights and details into consumer sentiment about all facets of brand loyalty engagement. The data provides robust learning into what motivates loyalty for brands across six key industries: Financial Services, Grocery, Entertainment (Cinema), Retail, Hospitality/Hotel and Airlines. 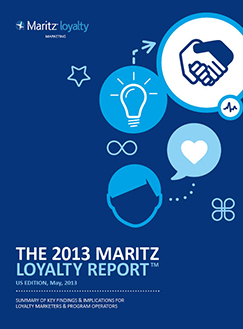 Click here for the Canadian Edition of the 2013 Loyalty Report.